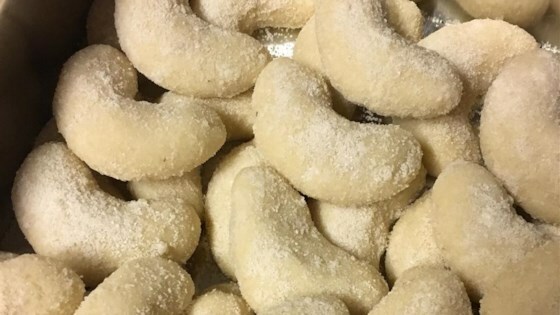 "This recipe is known in America as almond crescents. I converted the measurements and translated this recipe that has been in my family for generations. It's a German Christmas cookie." Preheat oven to 325 degrees F (170 degrees C). Line a baking sheet with parchment paper. Combine flour, 1/3 cup sugar, and ground almonds. Cut in butter with pastry blender, then quickly knead into a dough. Shape dough into logs and cut off 1/2-inch pieces. Shape each piece into a crescent and place on prepared baking sheet. Bake in preheated oven until edges are golden brown, 8 to 10 minutes. Cool 1 minute and carefully roll in vanilla sugar mixture. To make the Vanilla Sugar stick to the cookie better, I mix it with confectioners' sugar. This is very popular Christmas cookie in Germany. You need to add a pinch of salt, and eggs depending on how many cookies you make. Bake at 375 degrees and they come out perfectly. Mixing the vanilla sugar with regular sugar does make it stick better. Great cookie that melts in your mouth.